A foot or ankle injury caused in a workplace accident may not seem like a big deal until you experience one yourself. However, the reality is that these injuries can cause significant limitations in a person’s mobility and limit his ability to perform his job duties as well as simple day-to-day tasks. In some cases, a person can suffer a partial permanent disability or a permanent disability if the injury was more catastrophic, such as a loss of a limb. However, he may be entitled to workers’ compensation benefits under New Jersey law to pay for necessary medical treatments, rehabilitation services, and lost wages while he is off work recovering. What Are the Causes of Foot and Ankle Injuries at Work? What Are Common Ankle and Foot Injuries That Workers Suffer? Sprains and strains. If the ligaments and joints in the ankle are damaged or torn when the ankle is twisted or turned, a person can suffer an ankle sprain or strain. In some cases, rest, ice, and pain medication until the ankle heals is what is required. With more serious tears or damage, surgery could be required. In either case, a person’s ability to move around and work would be limited. Puncture wounds. A worker could suffer a painful puncture wound that limits his ability to stand and walk if he stepped on a sharp object left on the floor. Bone fractures. 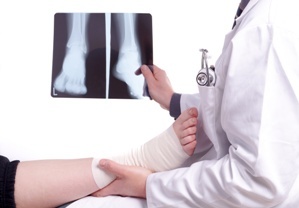 The ankle, foot, and toes, have many bones that can be easily broken in a workplace accident. In some accidents, such as being caught in heavy machinery, multiple bones can be fractured or crushed, sometimes causing a permanent disability. Tendonitis. Tendonitis is the inflammation or irritation of the tendons around the joints of the ankle that is often caused by overuse. It is very painful and can cause serious mobility limitations while the worker is off work recovering. Cartilage damage. When an employee suffers a serious sprain or fracture, he could injure the cartilage in the bone as well. Burns. If a person’s foot or ankle is splashed with dangerous chemicals, he could suffer a painful burn that could cause disfigurement, scars, and other injures. Foot amputation. A person can suffer a devastating foot or toe amputation if his foot is caught in machinery or in a work-related car accident. In addition, if a bone is fractured or crushed severely enough, it could result in the foot or toes needing to be amputated. If you suffered an ankle or foot injury at work, you need an experienced workers’ compensation attorney on your side if you want to receive the benefits you deserve. Let Manfred Ricciardelli assist you in filing your workers’ compensation claim, collecting the evidence you will need, hiring any necessary experts, and negotiating your settlement. Review our testimonials to learn how he has helped other satisfied clients and then call our office to schedule your free consultation.